I like to focus on details, often to a painstaking degree: I feel the constant need to adjust the balance between the details and the whole. So when I got my new laptop, I quickly went its BIOS settings and tried to examine all its available settings and whether they are fine tuned for the best performance (CPU states/voltages, memory latency/clock, etc are crucial to achieving this goal). pressing the A key (for "Advanced"?) 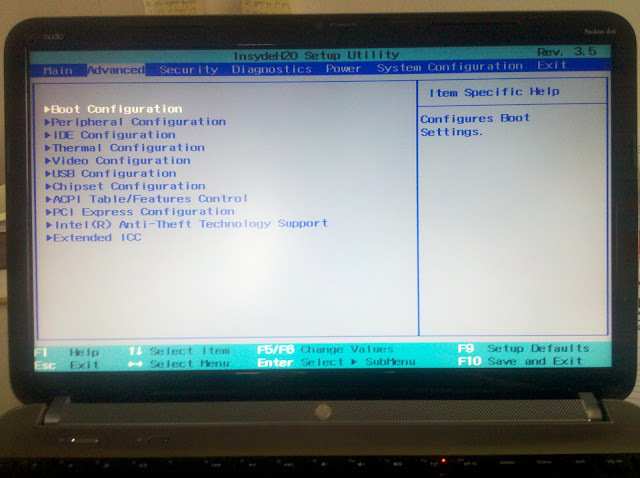 after pressing the F10 key (this gives your the BIOS setting page). I verified that this works with my BIOS with BIOS version F.13 (update: and F.1B). And here is a screenshot. Notice that there are two new tabs named Advanced and Power. There is one thing to note though: if you set a BIOS administrator password (which you should and many people forget to do), pressing the A key cannot get you to the advanced mode. You will have to clear your admin password and follow the procedure.